While the traditional bookstore reading is usually free and might be called a success if a few dozen show up, Obama's appearances will be at venues of 15,000 and higher in capacity. Check out the upcoming events at Chicago's United Center and you'll see Bulls games, Blackhawks games and concerts by Fleetwood Mac, Nicki Minaj and Cher, among others. And former first lady Michelle Obama, to launch her book tour in November. Just for the scale of its venues, there has never been a rollout quite like the one for Obama's memoir "Becoming," with stops including the Pepsi Center in Denver and American Airlines Center in Dallas. While popular authors have been likened to rock stars for years, Obama is the first to promote her book on a scale common for top musical performers, even using the entertainment company Live Nation. "Mrs. Obama wanted to make her tour as accessible as possible," Tara Traub, senior vice president of Live Nation Touring, said in a statement Friday. "The Live Nation team also knew the demand for her tour would be extraordinary. For these reasons, we knew an arena tour would maximize the number of people who will be able to join this unforgettable conversation with Mrs. Obama." Despite some complaints on social media about prices, tickets have been selling so quickly that this week Live Nation added two additional events, at Barclays Center in New York City and Capitol One Arena in Washington. "Truly humbled by the response to my upcoming book tour," Obama tweeted Thursday. Some fans will attend for free. According to Traub, 10 percent of tickets at each event will be donated to "local charities, schools and community groups in each city the tour visits." "This was a priority for Mrs. Obama and we are proud to collaborate on this effort," she said. In the top 10 on Amazon.com weeks before its Nov. 13 release date, Obama's book seems a guaranteed million-seller — a memoir by a popular first lady with an international following and a relatively limited history of discussing her private life, especially her eight years in the White House. Books by former first ladies have often sold well, with previous releases including Hillary Clinton's "Living History" and Laura Bush's "Spoken from the Heart." Obama's tour begins the week after the midterm elections. 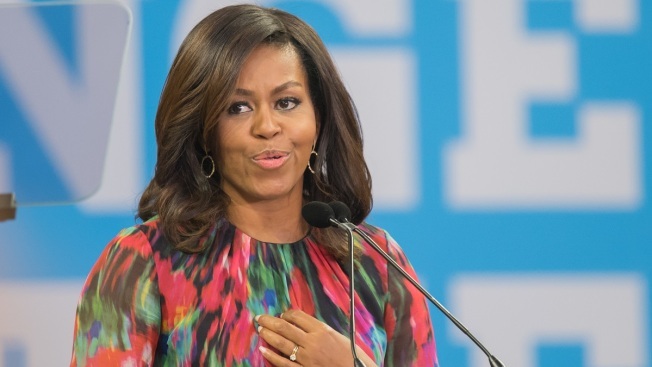 While former President Barack Obama has endorsed dozens of Democrats and increased his criticisms of President Donald Trump, Michelle Obama's involvement has focused on the nonpartisan When We All Vote, an initiative encouraging people to register. Advance promotions for her book have emphasized that she will chronicle "the experiences that have shaped her — from her childhood on the South Side of Chicago to her years as an executive balancing the demands of motherhood and work, to her time spent at the world's most famous address." Neither Live Nation nor Obama's publisher, Crown, would give specific details on what the tour will be like and what special guests might turn up, beyond confirming that the former first lady will be interviewed on stage. Crown spokesman David Drake also did not have specific details on the involvement of local booksellers, though he said they will have the "opportunity to participate in and benefit from Mrs. Obama's publication." Drake declined comment on whether a similar tour is planned for Barack Obama, whose memoir is expected next year. The Obamas agreed in 2017 to a multimillion-dollar deal with Crown for the two books and have projects for other media in the works, including a multiyear production deal with Netflix. Publicity directors for other publishing houses could not think of another time when venues the size of Barclays Center were used for an author. Clinton's book tour last year for "What Happened" included stops at the Boston Opera House and Seattle's Paramount Theatre, both with capacities of 2,500 to 3000. According to J.K. Rowling's U.S. publisher, Scholastic, the largest event for the "Harry Potter" author has been at New York's Radio City Music Hall, which seats around 6,000. Scholastic has its own brand name author out this fall, Dav Pilkey of "Captain Underpants" fame. Spokeswoman Charisse Meloto said an event in Frisco, Texas, at the Dr. Pepper Arena, which can seat more than 5,000, may have to be capped at 3,000 so the author can meet as many fans as possible. "He signs every single book and takes a photo with people," she said. "And lots of kids like to bring their own comic books to the events to show Dav. As you can imagine, this part slows down the signing line."